When I first began riding behind Ralph, I clung to him for dear life. 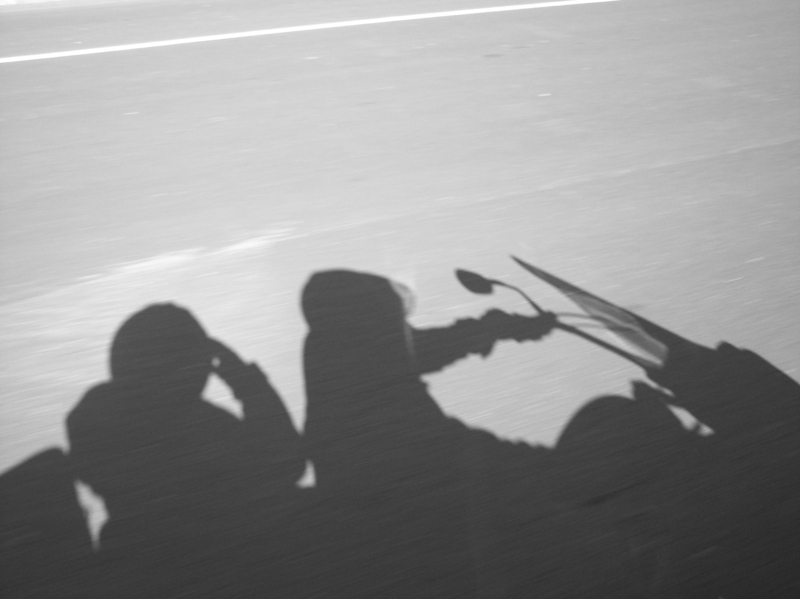 It made me nauseous to look down and to the side and see my shadow racing alongside me at 65 mph. I noticed passengers on other motorcycles were more relaxed. Some held onto the bars on the seat rest. Others simply sat with their hands in their laps. After a trip to the Grand Canyon via Rte. 66, I can look at my shadow now. And more often than not, I ride with a small digital camera in one hand. I still reach for Ralph when we hit a bump, but most of the time it’s “Look, Ma, no hands!” You have to have a certain amount of fatalism to sit on the back. If I leave the bike, I leave it. I’d rather be flung from it, I think, than trapped beneath it. Since I’m not distracted by having to keep the bike safely on the road, I have plenty of time to think, plan and pray (not out of fear, mind you, mostly I tell God thanks for the beautiful day). I planned Ride Minnesota on the back of our Victory. That’s where the book took shape. On the back of a motorcycle, in Minnesota. Posted on April 24, 2013, in Minnesota, Motorcycles, Ride Minnesota, Victory motorcycle and tagged book, Grand Canyon, motorcycles, Ride Minnesota, Rte. 66. Bookmark the permalink. Leave a comment.